Looking for somewhere to host a work party or event? We’ve got several fantastic private spaces that are perfect for all occasions. So whether you are celebrating a special birthday with family and friends or planning your work’s conference our team can work with you to provide the right room and package. To speak to our events co-ordinator, please contact us at events@trearddurbayhotel.co.uk. We’re also a popular wedding venue, scroll down for further information. Overlooking the golden sands of Trearddur Bay, our hotel is a great setting for coastal weddings and civil ceremonies. The waves crashing against the shore on the sandy beach makes for a stunning backdrop to your perfect day. Celebrate an Anglesey Wedding, choose from one of our wedding packages or tailor your own to add a personal touch. Our wedding coordinator is always on hand to help out and offer advice and guidance. 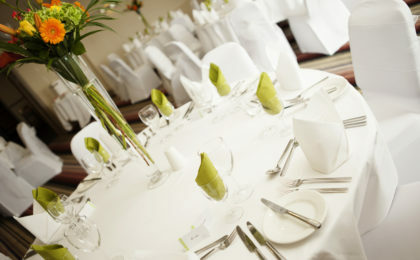 Trearddur Bay Hotel has 47 bedrooms, which are ideal for travelling guests or to keep your bridal party close to hand. We have family rooms that can accommodate up to six people, as well as four posters for the “Bride & Groom to be”. Choose a room with a balcony and sea view and take in the stunning surroundings of the hotel. Host your outdoor ceremony by the sea with a sea view wedding at our stunning venue. 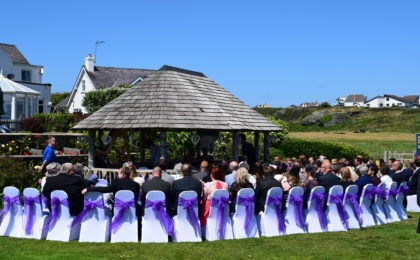 The idyllic location of the Trearddur Bay Hotel overlooking the beautiful sandy bay, is the perfect venue for your celebrations. We have five rooms licensed for civil ceremonies. We can cater for all party sizes from couples to parties of 150. For larger celebrations of up to 300 guests we are more than happy to accommodate marquees. We offer a wide selection of menu choices and drink packages, but if you would prefer to design a bespoke package for yourself and your guests, our wedding co-ordinator will assist you with all the planning. We have created several different packages to suit different requirements, individually priced and easy to choose. 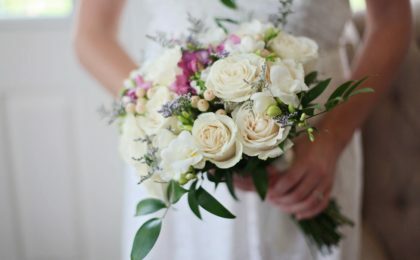 A ceremony room charge is applicable to all civil ceremonies and civil partnerships although charges vary throughout the year, so please contact your wedding co-ordinator for relevant information regarding your chosen date. Once you have chosen your date and are ready to confirm your wedding day, a £800.00 non-refundable deposit is required to secure your wedding booking. Creating fantastic food is what we’re all about. Our function menu offers a selection of tempting menus, from traditional wedding breakfasts to local specialties. We also offer a range of delicious buffets and supper menus, perfect for an evening reception. If you’d like to create your own personalised menu, individual prices can be given after consultation with your wedding planner. The Trearddur Bay Hotel has a well-stocked bar that can offer a drink for everyone, for any occasion. From non-alcoholic cocktails to champagne, we can provide a selection of drinks for your guests’ arrival, for the toast or just for the table.